After some initial skepticism, I have come to like the new bat decals on my car. I just needed time to adjust, I suppose. My homeowners claim for hail damage was accepted. Insurance will cover the cost of replacing my roof. Yay! I'm just waiting for the $$$ to land in my account, then it's off with the old roof and on with the new! 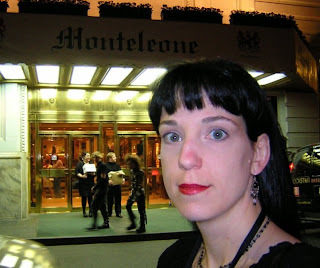 I’m usually not one to post photographs of myself, but I rediscovered a funny one while sorting photos. I think it’s hilarious because it looks totally fake. 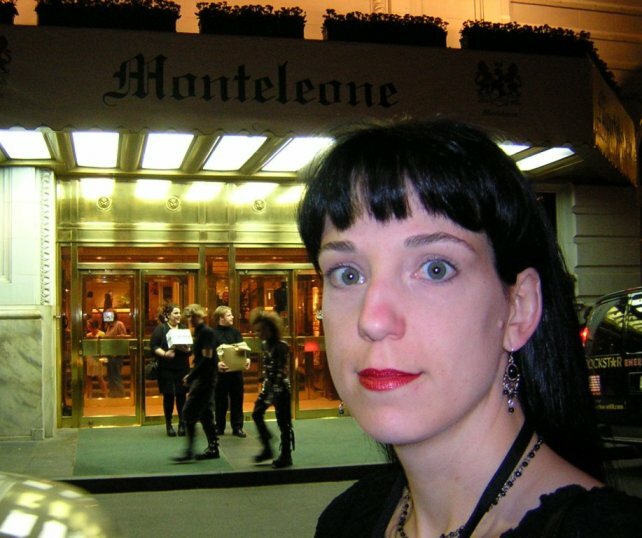 It looks like someone badly Photoshopped an extreme closeup of my head onto a photo of Edward Scissorhands' doppelganger walking past the Hotel Monteleone. A bit of background on this one... I have bad feet (not bad as in they sneak off at night to rob liquor stores, but bad as in it's hard to find shoes that even come close to fitting them). Most shoes hurt my feet, though not all in the same way; I dealt with this by rotating among them - pinchy shoes today, squeezy shoes tomorrow, chafy shoes the next day, and so forth. In fact, I used to choose my outfits based on what shoes I could tolerate that day. Anyone else ever find something that was so perfect for you that money almost didn't matter? 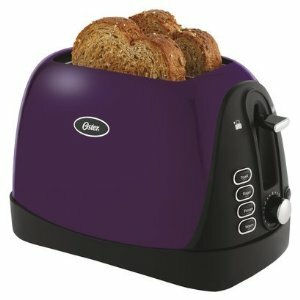 Your purple toaster is gorgeous!! Indeed. I want my home to be so comfortable and pleasing to my eye that it's always my favorite place in the world. I love that you can customize New Rocks, my friend showed it to me and I made a pair covered in spider webs (hahahaa), it's in my "I would like" list. Glad things are on the up and up in terms of your roof and new purple toaster =D And the picture of you is funny and awesome!!! The online tool for designing the boots is fun to play around with. Thank you! I don't really know why, but that picture strikes me as hilarious. God, I love New Rocks...and I want 'em so badly! I'd willingly spend a lot of money on shoes...I would..
Duuuuude. Happy feet, happy life. BUY BOOTS. Very true. It's hard to be anything but cranky when my feet hurt. YAY for the roof claim!! I agree with linnea-maria - my home is my sanctuary, and I strive to make it perfect for me! Glad to know you won't run the risk of a leaky roof ruining your hard work on the interior. If water from a leak made my wallpaper fall off, I'd probably sit down and cry. :P With the roof fixed, I'll feel safe to resume work on my ceiling. Grape jam is an absolute necessity. Mmmm... jam. I've seen lots of brightly colored kitchen wares lately... including kettles shaped like various veggies and fruits. Fun stuff. Width is the biggest issue for me. I have wide feet with narrow heels and bony ankles... "duck feet" as my mom says. :/ And I don't like my toes. I won't wear open-toe shoes. You might like the book "Make Your Own Shoes" by Mary Wales Loomis. It tells how to make your own shoes, but also how you can make a last that is customized for your feet. The idea of custom shoes has crossed my mind many times. It would be awesome to have shoes that really, truly fit my feet. The methods are simple enough -- it's aimed for a home shoemaker. The only problem is the resulting shoes can be a little flimsy since they don't have as much hardware holding them together as a factory shoe. The book specifies that they're "good enough for ladies shoes." Agreed. Being frugal is about making wise money choices, not about buying the cheapest every time. I also think one can be frugal without having to feel deprived. Hooray for the bats! Thank you! I do love that toaster. :) And it's a major improvement over my old cheapie. I just found this blog and this post. I have been looking for nice shoes that aren't the gaudy, cheap, Goth kiddy kind. I ended up buying a pair of Doc Marten's with one buckle, and they're quite nice, but those New Rocks, wow, have they got quite a variety, even after eliminating the gaudy ones. Are they a publicly traded company? You might want to buy some stock before I buy all their shoes.